Seeking help is hard. If you haven’t read it yet, in our previous blog post, we talked about the common barriers preventing people from seeking the help they need. So the next step is finding the right solution for you, that overcomes these barriers. And Inuka might be the solution you are looking for! Why do I think Inuka might be the solution you are looking for? It addresses all the barriers that prevent us from seeking help. 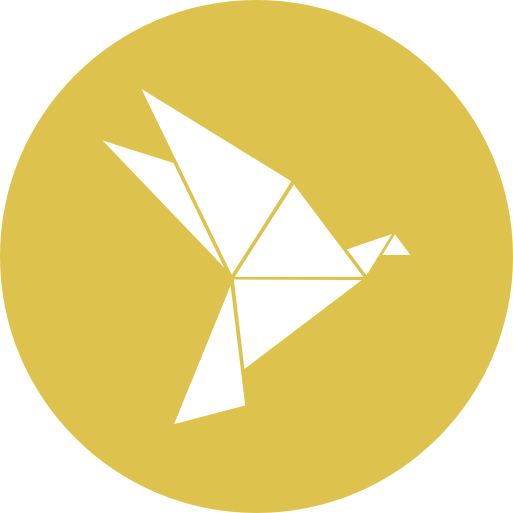 Through confidential, anonymous chat you get access to a personal guide. This guide helps you identify your challenges, helps you make a plan to tackle those and follows up to see how you’re doing. The guides are carefully selected by us and trained on a proven method developed by our co-founder Prof. Dr. Dixon Chibanda. At Inuka we aim to reduce the taboo and stigma associated with issues pertaining to mental health. How? By openly talking about them. By speaking frankly about mental health, we believe we can redefine these issues. Because we believe there is strength in sharing. No problem is too small! No matter how small your problem might be, at Inuka, we are here to help. So don’t wait until the problem gets worse because you think the severity of your problem does not warrant help. The sooner you take the step towards seeking help, the sooner we can get started at helping you through our step-by-step process. There is dignity in the struggle. We believe admitting there is a problem and asking for help is a sign of strength and that a mental health crisis is an opportunity. It is not a sign of weakness; rather there is dignity in the struggle. There is a hero inside all of us. Inuka just equips you with the tools and people to become your own hero and overcome your challenges. At Inuka, your identity remains confidential through the use of anonymous chat: your guide does not know who your are and neither does the therapist they work with. We also aim to hold ourselves to the European privacy standards (GDPR) – which is the toughest privacy standard around. It doesn’t matter where our clients are from, all their data will be treated with the same care. 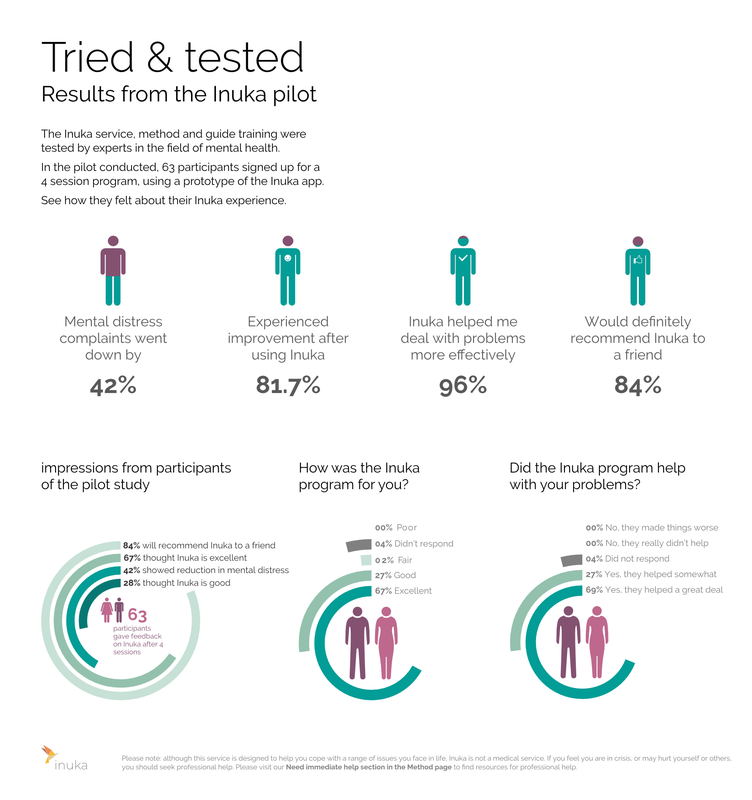 The Inuka method is based on problem-solving therapy (a form of cognitive-behavioral therapy). The step-by-step approach of this method helps you break down your problem and how to solve it, into bite-size steps and equips you with problem-solving skills to better cope with life’s future challenges. This method of breaking the process down into bite-size steps makes the process a lot more easily doable. People often find this method more approachable than other commonly used techniques. Seeking help often involves endless administrative tasks and results in you getting buried in a pile of paperwork. At Inuka, we have made the process of seeking help as hassle-free and easy for you as possible. With a user-friendly app, all you need to do to get started is, sign up, get assessed, pay for a rogram and select your personal guide. Now you are all set and can book your chat session anytime. The Inuka method does not waste time or energy. Your guide uses the problem-solving based method to efficiently identify your problems, make a plan and track your progression. These bite-size steps are motivating and energizing, rather than emotionally draining. No deep discussions about the past or root causes, but rather practical, action-oriented support so you’re ready to tackle your challenges head-on! Inuka aims to make care readily available and accessible. Through the use of technology, Inuka offers affordable, local care where it is lacking. 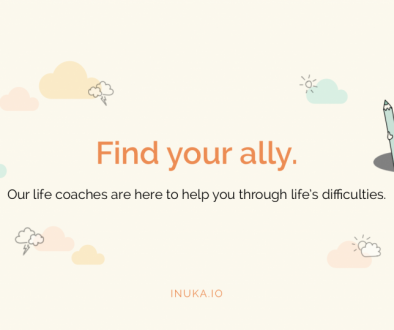 The flexibility of the Inuka method and being able to book sessions anytime, at times that suit you, allows you to seek the help you need but still tend to your responsibilities of work or school or child-care. So, if you are looking for an easy and safe solution, that makes use of a proven method. If you are ready to break the cycle and find your inner hero (cheesy but true!) – then I think Inuka is the solution you are looking for. 10 things keeping you from seeking the help you need	5 reasons I embraced personal crises as an opportunity for growth.